Last few weeks were so busy and difficult for our family, I'm a little late on everything I plan to have done, posted, shown... So finally I'm back to share great news! This is my first card I made as DT Member of Dutch Dare Card Challenges. I'm so exited about this!! Our challenge this week is New Beginnings sponsored by Crafty Sentiments who's stamps are very pretty and cute. So new baby, new house, new job, new school year, there are a ton of possibilities! Show us your take on New Beginnings! 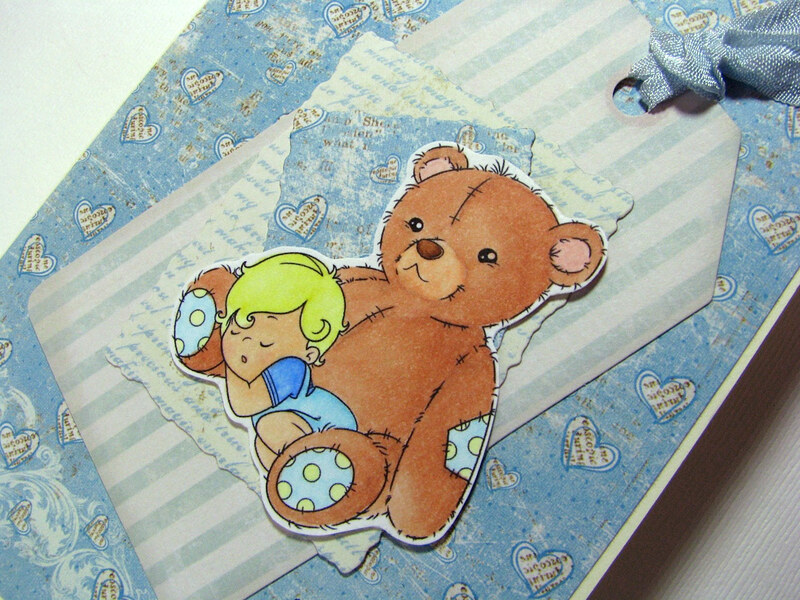 Don't forget to check all the cards made for DDCC#146-Crafty Sentiments-New Beginnings by amazing Dutch Dare DT!! 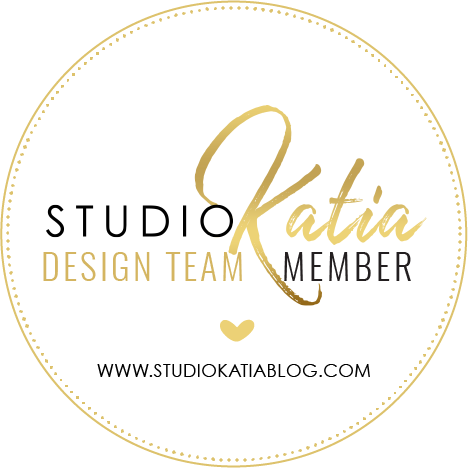 There're fabulous and very inspiring projects to see! I hope to see you join our challenge this week! Сьогодні хочу поділитися з вами не лише листівкою, але й чудовою новиною. Мене взяли дизайнером у чудову команду Dutch Dare Card Challenges. Так що тепер кожні два тижні я ділитимуся з вами листівками, зробленими для цього блогу та чудових спонсорів! Цього тижня ми маємо завдання під назвою New Beginnings (Новий початок), спонсором якого є Crafty Sentiments з їх чудовими штампами!! Отже ви можете зробити листівку з нагоди народження малятка, одруження друзів, новосілля, отримання нової роботи, на початок нового шкільного року чи будь-що, що асоціюється вам із "новим початком", та взяти участь у нашому завданні! Запрошую також переглянути чудові роботи нашої команди. Вони точно надихнуть вас на створення власних шедеврів!! I had a pleasure to play with Luke & Teddy Stamp. I made a card for baby boy (having two boys myself what could I've chosen? LOL). Used papers from very cute Sweet Fairy collection by Prima, added a tag from Melissa Francess' 5th Avenue, crinkled ribbon from PixieDustPaperie and a stamp from Inkadinkando (Inchies - Baby). Coloured the image with my copic markers. That sleeping baby is so cute, I'm definitely coming back to it again! Я зробила листівку для привітання з народженням малятка, хлопчика. Штампик я розмалювала фломастерами copic. Використала папір Prima та теґ від Меліси Френцесс. Маленький штампик у кутику - це так звані "інчики" від Inkadinkando. Який той ведмедик з дитятком солодкі!!! Вітаю з такою подією!!! Буду з нетерпінням чекати нових листівок. This is so very cute Lilia!! That is so very cute, thanks for playing along with Pixie! Gorgeous card Lilia! I love how you have used those tags on your card! Thanks for joining in the Punch it challenge at Pollycraft! Aww - cute card Lilia! And congrats on making the DT team! I hope you had a wonderful Christmas & New Year! And I see congrats are in order for you too on your wonderful news - I hope you are keeping well! What a precious card and congrats on making the DT! Thanks for sharing with us at Pile It On! Such an adorable sweet card. Love the fresh colour combo. Thanks for joining us at MMCS Challenge this week. Congratulations for making the design team, Lilia. This is my first visit to your blog and I can see why you were chosen. 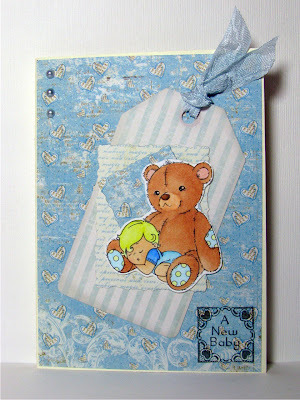 Love your baby boy card... the papers are beautiful and your image is adorable... wonderful work! Thanks for playing along with us at Pixie! Лілю, щирі вітання!!! Чудовий дебют! Дуже ніжно і з акцентом;) Приємного дизайнерства й надалі! You need to check the date on your posts. This one has 07/01/2011 on the top. I was looking for the Robyn's Fetish card for challenge 89. I was looking at it on the challenge site. Too darn cute! Thanks for playing along with the Pixie Challenge! Oh my goodness, what an adorable baby card...love the teeny hearts! Thanks for playing along with Pixie Dust Paperie! This is just so cute! Thank you for playing along with the Pixie Dust Challange!